a continent-wide network of real estate sites and services. Point 2 is partnered with dozens of other real estate services online. When a property is posted on Lacy Realty, it instantly can be viewed by these syndication partners, including Yahoo! classifieds, Google Base, and Trulia. The New York Times, Ebay, and Craigslist are optional syndicates that can be used at the request of the seller. When you list with us, your property isn't shown on one website... it is seen all over the world wide web! Point2's Exposure Engine™ completely automates the process of entering, formatting and submitting asset listings for our customers. When Point2 NLS members enter listings into the system, they are converted to multiple formats and fed to several major listings marketplaces. New York Times — The No. 1 newspaper website in the US, and the Great Homes network of newspaper websites, including The Boston Globe, The International Herald Tribune, The Sarasota Herald Tribune, and the The Santa Rosa Press Democrat extends your reach to approximately 36 million unique visitors per month. Google Base — The world's #1 search engine, Google's mission is to organize the world's information and make it universally accessible and useful. Rather than wait for Google to index your site and your listings, use Google Base to upload your listings directly to them. Yahoo Real Estate — Yahoo! Inc. is one of the most trafficked Internet destinations worldwide. Single listings on Yahoo! Classifieds cost $34.95/listing. 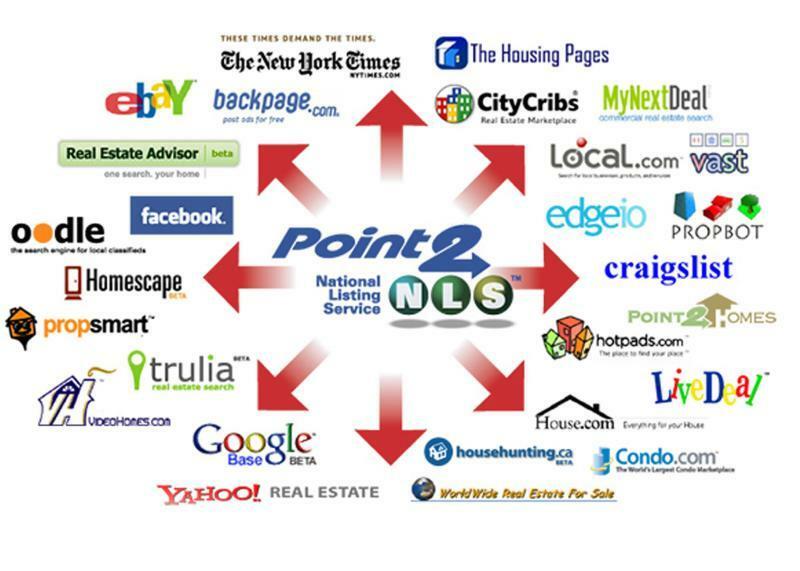 Point2 NLS can feed each of your listings to Yahoo! Classifieds for free. Ebay — eBay is The World's Online Marketplace enabling trade on a local, national and international basis. For real estate, eBay offers the posting of fixed price classifieds ads. eBay is one of the most trafficked websites on the Internet. Craigslist — Craigslist is a centralized network of online urban communities, featuring free classified advertisements and forums sorted by various topics. a successful and growing source of free leads for Point2 members. Oodle — Oodle is a leading search engine for local classifieds with over 17 million active listings. Oodle powers the classified search on the following site Lycos, Express.com, The Sun, Yell.com and Local.com. Trulia — Trulia is a residential real estate search engine that helps consumers search for home for sale, trends, neighborhood insights, and other real estate information directly from real estate agent and broker web sites. LiveDeal — LiveDeal is a free, local online classifieds market with reach into every city and zip code across the U.S. It is one of the country’s top 10 most visited online classifieds sites. PropSmart — Propsmart is a real estate search engine, aggregating over a million property listings. Condo.com — Condo.com (formerly US Condo Exchange, www.uscondex.com), is a global advertising portal for condos attracting over 15 million viewers per month. Real Estate Advisor — RealEstateAdvisor is a real estate search engine that aggregates real estate listings and drives traffic directly back to agent and broker sites. Backpage — Backpage.com is a community website where you can post ads for free. Currently operating in 75 markets in the US, the site serves as the online classified solution for several newspapers, radio stations and TV stations while growing at a rate of 22% month over month. City Cribs — CityCribs is a New York based marketplace for real estate attracting visitors looking to buy, sell and rent properties. CityCribs has quickly grown into a national housing marketplace driving thousands of daily visitors. Edgeio — The edgeio platform aggregates, organizes, and distributes listings of all types. It is free to post to edgeio and listings always link back to the listing publishers. Hotpads.com — Hotpads is an innovative map-based search site for rental housing. HomeScape — Homescape provides local, comprehensive property listings and rich content to home buyers and sellers nationwide, while delivering a suite of advertising solutions that offer choice and results that enable real estate professionals to grow their business. My Next Deal — MyNextDeal.com is a new commercial real estate search site representing one of the only vertical search engines soley for commercial property listings. Propbot — PropBot is a free property listing service and is committed to publishing complete content to generate better results. The Housing Pages — TheHousingPages.com is designed as a central resource center for consumers looking to to buy or sell a home. Vast — Vast is a database of classified ads that uses advanced technology to parse and tag ads for better search. CLR Search — CLRSearch.com is a real estate search engine that provides a data rich environment to explore listings, community demographics, and other data relevant to one of the most important decisions in your life. Video Homes — Videohomes.com LLC developed The Video Homes Network as a GEO vertical Search portal that brings consumers to geographic specific real estate destinations in a media-rich local atmosphere. Worldwide-Realestate-ForSale — WorldWide-RealEstate-ForSale.com is an international property listing directory featuring real estate listings from all over the world. This advanced search engine displays listing information to thousands of daily visitors. HouseHunting.ca — Househunting.ca is part of the Canada.com Network operated by CanWest Interactive, a division of CanWest MediaWorks Publications Inc.
Cyberhomes Harness the power of Cyberhomes™ and AOL Real Estate to display your listings and get more consumer traffic and leads, all at no cost. With access to more than 100 million property records, Cyberhomes delivers the information consumers are looking for -- home valuations, neighborhood and school information, aerial and heat maps – with many more hot features added regularly. Clickable City Directories —The Clickable City Directory provides real estate listings for all cities and all zip codes throughout the United States. Its reach is national, its focus: purely local.